When they asked me participate in Apartment Guide's Holiday Home Organization Blogger Challenge, I decided to use it as an incentive to tackle a project that has been on my To Do List for longer than it should be. Since I finished almost all of my holiday gift shopping, I should have more time for this project. Don’t go hating me for finishing my shopping early because that part is organized. If you need help in that area, Apartment Guide has some tips on how to plan and organize your holiday shopping which work whether you live in an apartment or not. Well, gang before I skip off to read the boatload of home organization tips and ideas on Apartment Guide to help me formulate a plan to deal with the paper explosion in my office, let’s get this party started with a giveaway for YOU! 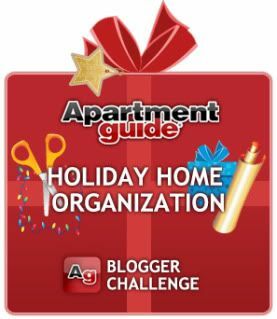 As part of the Holiday Home Organization Blogger Challenge Apartment Guide has generously agreed to sponsor a giveaway of ONE $100 AmEx Gift Card. That’s right, 100 smackers FOR YOU. To enter: Leave a comment on Condo Blues telling me your favorite holiday organization tip or challenge. As you can see from my office, I need all of the help and incentive I can get. You must leave your email address so I can contact you if you win or your entry will be disqualified. If your email address is available via your Blogger profile that counts. I am not going to do anything mischievous with your email address. I just want to contact you about sending your prize to you if you win because not being able to contact giveaway winners makes me sad. 5. Follow Condo Blues on Twitter AND tweet about the contest. Please leave your user name and the URL of your tweet in your comment so I can verify it. You must leave a separate comment for each method you used to enter the contest. If you choose to use every method of entry, you have up to NINE chances to win! I will use a random generator to select the winner. The $100 AmEx Gift Card Giveaway November 16, 2010 – December 4, 2010 12 midnight EST. Good Luck! Update: Congratulations to the winner tcarolinep ! My organization tip is to use shelving in the laundry room. It's helped us a lot! I like Apt Guide on FB with my username Mary Happymommy. I subscribed to Condo Blues via email. I like Condo Blues on FB with my username Mary Happymommy. I liked Apt guide on Fb!Great giveaway!! My fave tip is to pre-cook food for the days prior to each holiday so that all my focus can be put where it needs to be. This means making some casseroles, personal pizzas, and soups and then freezing them. Then for a few days prior to the holidays I just take them out, thaw them, and heat. I can concentrate on all that holiday goodness without the distraction of having to cook! Liked Apt Guide on Facebook. Followed Apt Guide on Twitter. I store my rolls of wrapping paper in a trash can. That way they aren't bent and you can easily see what your working with! I am a fan of Apartment Guide on Facebook! Well, most of the holidays is challenging to me. What about deciding what to bring to a covered dish Thanksgiving meal? I'm planning to bring something sweet and something not-so-sweet, and if I get inspired and have time, maybe I'll bring another dish. A tip would be to ask your kids and dh what they enjoyed from last year, their favorites, and what they didn't enjoy, and what new traditions they'd like to begin. As for your office, it looks fairly organized to me. You could temporarily store your current decorations in a plastic tub, if that helps. My tip is twofold - put things away as you go and look outside of the box for storage ideas. Under your bed, over the washing machine, under the couch, etc. I have a friend who stores canned goods on a shelf in her bathroom closet. We live in a small apartment, so our Christmas stuff is on a shelf in our closet. I'll bite with a challenge, two of them: my husband and daughter! While I despise clutter and do a great job of putting things away, they do not in the least. I can keep up with my own junk but three people's is too much. My challenge: Staying on top of the paper and making time to decorate! My organization tip is to start with surfaced like your desk or kitchen table. 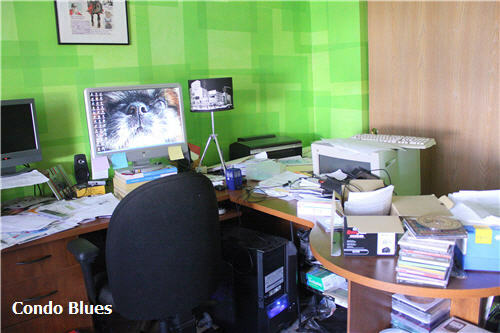 Clearing off these areas makes a big impact in making a room feel cleaning and always inspired me to keep going! My organization challenge is to get closets and kids room in order. With so many clothes and stuffs, it's overwhelming. My organization tip is to utilize storage containers. There's so much that you don't use on a daily basis. Squirrel away your documents, holiday decor, or anything else into themed storage bins until you need them. File folder storage bins are less expensive than a filing cabinet and do the same job. I am following @AptGuide on Twitter. I've been following @CondoBlues on twitter... and love your tweets! Happy to follow your other social media sites. My organizing tip is to use Glad Peel 'n Stick to keep rolls of wrapping paper neat. Just put three or four strips around the roll and stick them together. I liked Apt Guide on FB. My tip is to win this giveaway so I can pay my niece to babysit while I organize! By the way, I love your blog! My organization tip.... okay, I have two. Short of acquiring OCD, which is what keeps ME organized, you can: 1) Have a designation in-progress drawer--a drawer that is kept empty aside from something you are immediately working on but don't want to set on an exposed surface, thus contributing to clutter. This will not work for procrastinators or you will just end up with a junk drawer. Or 2) Do things as you see them, just one thing at a time. For instance, you might pass a dusty shelf and think AHHHHG! I have no time to dust! Maybe not, but grab a rag or a tshirt out of the hamper, and just dust that one shelf then and there. When you pass a disaster zone in your house, grab one item and put it away. That way you don't overwhelm yourself and you don't forget the things you noticed need doing, because you do them as you notice them! I like Apartment Guide on FB! I subscribed to Apartment guide by email! I subscribed to Condo Blues feed! I'm a fan of Condo Blues on FB! I subscribed to Lazy Budget Chef feed! my biggest challenge this time of year is where to put things I have purchased for Christmas that don't fit into the "gift closet". my favorite tip is mine: use the top of egg cartons (the flat cover) as a spoon rest when cooking. I rip off the tops and stack them. I use one half each time. so easy to toss out and it is a re-use of something. Hope to win that c-note! I cook a lot of the meals before the actual big day so I space it out and don't get so stressed out. My organization tip is to use bins and label them. I have one for mail that needs to be opened, bills that need to be paid, paid bills, importment papers to keep and some for the grand-daughters work needs. AND tweet about the contest. I bought one of the stand up wrapping paper holders and it's the best thing. I have everything I need all in one place. I like Condo blues on fb. I like Apartment guide on fb. It is so easy to bring in new stuff around the holidays, so I make sure to purge at least one thing for every item that enters the house! My organizational tip is to use the space under beds to neatly store items in bins to pull out as needed. Thanks for the chance to win! I like them on FB "Crave to Save"! I think cleaning off surfaces and putting everything in ginat box to sort into other boxes helps me! My best holiday organization tip is to use different colored wrapping paper for different people (or for different groups of people, if you have to transport gifts to more than one holiday gathering). It makes sorting gifts so much faster. We also have separate storage bins for wrapping supplies, tree decorations, and other decorations. Easy to find what you need quickly. I also like Condo Blues on Facebook. my organizational tip is to start cleaning/organizing a room by throwing out everything you dont need first. We've set up more shelves in the basement, to put the seasonal items away. Easier than the attic! I use sections of my attic for different things: one section for Christmas decorations, one section for boxed up clothes, one section for baby items. I have liked Apartment Guide on facebook. I have liked Condo Blues on facebook. To keep organized our rule is A Place for Everything, and Everything in it's place! I follow Condo Blues on FB! Love that this is an "apartment/condo" home organization post. I live in an apartment style townhouse and with 3 daughters in 1 room, I use over the door cubby organizer for socks/undies, I utilize all hanger space in the closet, and we use under the bed storage. Following Apt. Guide on twitter as cbrooksCynthia. Subscribed to Condo Blue's emails. Liked Condo blues on fb as Cynthia Brooks. I'm slowly having success with organizing a lot of stuff in clear plastic bins- mostly the kids' stuff. Shelving rocks too. Organization tip -- get rid of things you clean out immediately. Don't save them for a "yard sale someday". I have fallen into this trap for too long! I follow apartment guide on facebook. I follow Apt Guide on twitter! I like to use wall shelving with the burlap covered boxes for extra storage. I guess I didn't realize you had a FB page for Condo Blues -- OK, I just liked the page! Biggest challenge - finding places to keep the wrapped presents. I follow you on Twitter @JalapenoMama and I tweeted. Subscribed to your food blog Lazy Budget Chef RSS feed via Google Reader. My favorite organizational tip is really year-round but even more important to me at Christmas (when space is really at a minimum: I keep a permanent box designated for the Salvation Army in my laundry room so I can easily have a place to get things out of the house when I spot them. When it's full, I just load it in the car for my next trip to work. I subscribe to the Lazy Budget Chef by email. I subscribed to Condo Blues by email. my favorite organization tip has to be having plenty of organization bins and containers. It helps greatly. I like to use plastic drawer sets. They keep everything nice & neat and organized. I follow @AptGuide on Twitter as @calidreamin87. I subscribe to the Condo Blues RSS feed w/Google Reader. I subscribe to Lazy Budget Chef's RSS feed w/Google Reader. My biggest challenge is putting everything away AFTER the holiday.